United Nations Security Council Resolution 688, passed in April 1991, demanded that Iraqi leader Saddam Hussein end the repression of the Iraqi civilian population. Iraqi military bombing and strafing attacks against the Shi'ite Muslims in Southern Iraq during the remainder of 1991 and during 1992 indicated Hussein chose not to comply with the U.N. resolution. President George Bush announced Aug. 26, 1992, a decision by a coalition of U.N. forces to begin surveillance operations in Iraq below the 32nd parallel. The goal was to ensure Iraq's compliance with UNSCR 688. To facilitate the monitoring, the coalition barred all Iraqi fixed and rotary wing aircraft from flying over the surveillance area. With the president's announcement, U.S. Central Command activated Joint Task Force Southwest Asia, a command and control unit for coalition forces monitoring the no-fly zone. The mission was dubbed Operation Southern Watch. The first Southern Watch sortie was flown Aug. 27, 1992 - less than 24 hours after the announcement. At first, Iraq complied with the no-fly restriction, but Hussein began challenging Southern Watch operations after the UN's decision to retain sanctions against Iraq, Nov. 24, 1992. A U.S. Air Force F-16 on patrol in the no-fly zone Dec. 27, 1992, encountered a MiG-25 Foxbat. When the MiG pilot locked his air-to-air radar on the F-16, the American pilot destroyed the Foxbat with an air-to-air missile. Shortly after the shoot down, Hussein positioned surface-to-air missiles in Southern Iraq below the 32nd parallel. Since these missiles threatened pilots flying Southern Watch missions, the coalition ordered Hussein to move them above the 32nd parallel. Hussein ignored the ultimatum, even after warnings from the U.N.
On Jan. 6, 1993, four U.N. allies, the United States, Russia, France and the United Kingdom, agreed to work together in enforcing UNSCR 688. A week later, coalition aircraft destroyed surface to air missile sites and their command and control units in Southern Iraq. In addition to this action, on Jan. 17 coalition naval forces disabled an Iraqi nuclear facility with Tomahawk cruise missiles in support of UNSCR 687, the resolution demanding the destruction of all Iraqi weapons of mass destruction. The following day, the allies launched a successful air raid against Iraqi SAM systems below the 32nd parallel. Three months later, on April 18, 1993, a coalition F-4G aircraft fired a missile into an Iraqi anti-aircraft position after being illuminated by radar from that site. In April 1992, the Iraqi government sponsored an assassination attempt on President Bush during his visit to Kuwait. This plot prompted a unilateral U.S. Tomahawk missile strike June 26, 1993. 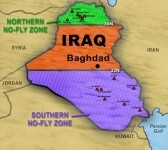 Although Iraq challenged the no-fly zone several times in 1992 and 1993, the first nine months of 1994 passed without incident. Due to the relative calm in the Operation SOUTHERN WATCH area, Joint Task Force - South West Asia (JTF-SWA) began a force drawdown in February 1994, with the redeployment of the 49th Fighter Wing and other USCENTAF assets to CONUS from Khamis Mushiat, Saudi Arabia. The operation consisted of a four-phased redeployment of personnel and equipment, and involved the movement in February of 8 F-117's, approximately 300 personnel, and 958 short tons of equipment to home stations in the United States. In March 1994, JTF-SWA continued the drawdown of forces in support of Operation SOUTHERN WATCH by redeploying 3 F-16, 3 F-15E, and 3 F-15C aircraft from Dhahran, Saudi Arabia to the United States. SOUTHERN WATCH operations continued without incident until October, 1994, when Iraq began troop movements south towards Kuwait, prompting U.S. and coalition forces to react with force deployments into theater under Operation VIGILANT WARRIOR. In October 1994, Hussein, upset about continued U.N. sanctions, began a series of verbal threats. He insisted on a date upon which the sanctions would end. He deployed a significant number of armored vehicles and mechanized infantry troops to Southern Iraq and to the Kuwaiti border. Coalition forces responded with increased surveillance operations, deployment of additional aircraft and forces to the AOR and a firm resolve to deter Iraqi aggression, and if necessary, defend the Arabian Peninsula from attacking Iraqi forces. The coalition governments, at the same time, said they would not be intimidated into deciding an end-date for the sanctions. Hussein insisted he had the right to move his troops anywhere he wanted to within his own borders but decided to withdraw them in response to appeals from friendly parties in the Gulf region. Iraqi radio reported that the U.S. had backed down. Out of Operation Vigilant Warrior came a unanimously approved resolution by the U.N. Security Council. United Nations Security Council Resolution 949 prohibits Iraq from using its forces to threaten neighboring countries or U.N. operations in Iraq, and from deploying units south of the 32nd parallel or from otherwise enhancing its military capabilities in Southern Iraq. Operation Southern Watch was initially an operation in which the Gulf states cooperated. Following an additional Iraqi confrontation in September 1996 - Operation Desert Strike - JTF-SWA continues to perform its primary mission of monitoring airspace now south of the 33rd parallel in Southern Iraq using air forces deployed by the U.S. Air Force and Navy carrier battle groups in the Arabian Gulf and Red Sea, as well as the United Kingdom's Royal Air Force. Other coalition forces also patrol the no-fly zone south of the 32nd parallel. Coalition naval forces also provide maritime intercept operations in the northern Red Sea and the Arabian Gulf in support of U.N. sanctions against Iraq. JTF-SWA includes American, British, French and Saudi Arabian forces. JTF-SWA headquarters consists of a command section and five directorates: J-1 for personnel, J-2 for intelligence, J-3 for operations, J-4 for logistics and J-6 for communications, plus a public affairs and legal staff. US Navy, Marine and Air Force units continued to enforce the U.N.-mandated no-fly zone over Iraq, protecting Iraqi minority populations. Naval operations in 1996 included extensive Navy and Marine aircraft sorties from the carriers America (CV 66), Nimitz (CVN 68), George Washington (CVN 73), Carl Vinson (CVN 70), Enterprise (CVN 65), Kitty Hawk (CV 63) and amphibious assault ship Peleliu (LHA 4). Over 6,000 Air Force personnel are deployed in support of the coalition Operation Southern Watch air operation over southern Iraq. Air Force aircraft and crews had flown 68 percent of the total sorties at the end of January 1997 -- amounting to over 28,800 sorties flown in support of this coalition effort since 1991. The "Gunfighters" of the 366th Wing deployed to Saudi Arabia supporting Operation Southern Watch between 04 February and 01 July 1997. The deployment gradually built up to 1,200 people which represents about one-third of Mountain Home's active-duty population. Also known as America's Air Expeditionary Wing, the 366th deployed 52 aircraft from four squadrons; 18 F-15 Eagles from the 390th Fighter Squadron, 18 F-15E Strike Eagles from the 391st FS, 12 F-16C Fighting Falcons from the 389th FS, and four KC-135R Stratotankers from the 22nd Air Refueling Squadron. The June 1996 bombing of the Khobar Towers in Saudi Arabia accelerated Air Force efforts to protect its forces operating around the globe. Responding to this tragedy, the Air Force, in conjunction with the United States Army, assisted in the repatriation of over 900 DoD military members, civilian personnel and their families. At the same time, the Air Force relocated the majority of its Southern Watch forces to Prince Sultan Air Base at Al Kharj and instituted a series of additional force protection measures throughout US Central Command's area of responsibility. For four consecutive years funding for Southern Watch and related operations has been provided through a request for supplemental appropriations for the Department of Defense. The requirement for supplemental funds in 1998 was due to the substantial movement of forces to the Persian Gulf region from November 1997-March 1998 in response to Iraq's refusal to comply with United Nations' mandates regarding arms inspections. In April 1998 the Congress appropriated $1,312,400,000 for operations in Southwest Asia as part of the Emergency SupplementalAppropriations Act. France suspended participation in this operation on 15 December 1998 at the time of the American-British bombing of Iraq in Operation DESERT FOX. France was of the view that the strikes have been going on for more than a year and that tensions persisted. France still has men and equipment present because of military cooperation there. but no longer participates in air operations. Coalition aircraft do not target civilian populations or infrastructure and seek to avoid injury to civilians and damage to civilian facilities. However, according to published reports, between January 1999 and April 2000 air operations have caused the deaths of 175 civilians and wounded nearly 500. 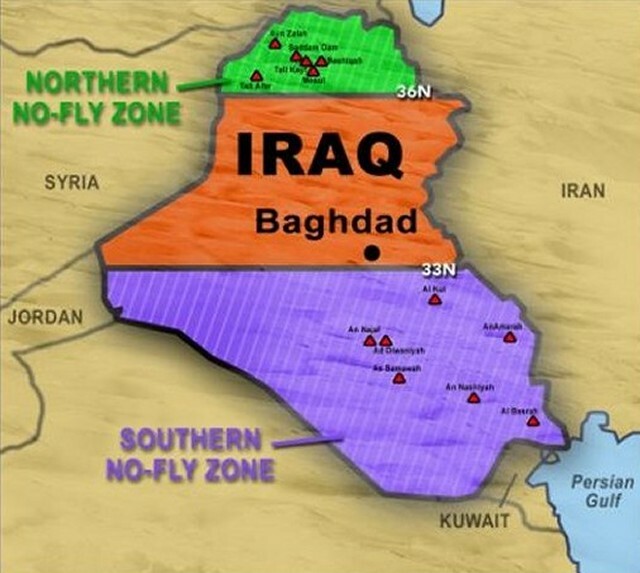 By early 2001 pilots had entered the southern "no-fly" zone in Iraq 153,000 times since 1992. Not one pilot has been lost. Between February 2000 and February 2001 allied pilots entered the zone 10,000 times. On 500 occasions, the Iraqis fixed radar on the jets or engaged them with anti-aircraft weapons. Until mid-2002, tracking the number of Southern Watch strikes against Iraqi targets was particularly difficult. CENTCOM releases prior to 2001 are extremely vague and contradictory, often headlines reading that "sites" plural had been attacked though the text of the release lacks sufficient specific information for one to determine whether the sites are at the same location or whether they are in differrent areas. Often CENTCOM releases discuss strikes on multiple types of targets which can also further confuse the counts. The result is that there are conflicting estimates as to how many strikes occurred. Depending on whether or not one rounds down the number of strikes (attacks on multiple targets at one location equals one strike) the estimate could be between 34 and 38, or if one rounds up (attacks on multiple targets equal multiple strikes) the number of strikes would be 45. Adding to the confusion, on Sept. 30, 2002, during a DOD briefing, General Myers stated that there were 32 strikes in 2001.